My daughter, Olivia, is starting grade 7 in the fall. I can’t believe how fast she is growing up. Where does time go? Seriously it seems like just yesterday that she was starting school and now she is almost a teenager! With her progression to a higher grade comes new responsibilities of more homework. In the past, I always liked to start my school supply shopping early to beat the end of August rush. The stores are always so picked over and there’s usually not much selection to choose from. I only recently learned about a company that sells both fashionable and functional school and office products- Carolina Pad. 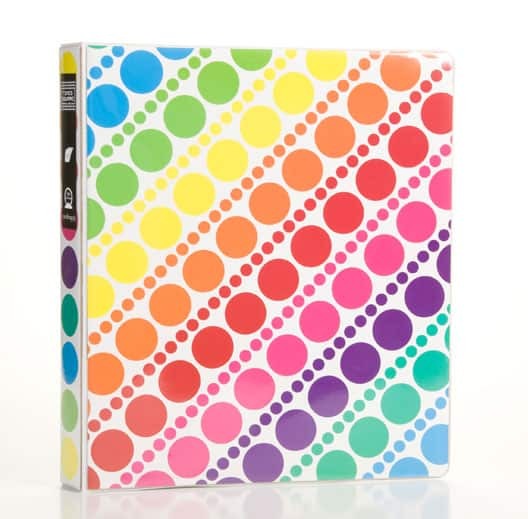 They introduced their line of stationery products back in 2000 and I wish I had of known of them sooner. Its better late than never because they have EXACTLY what Olivia is looking for in her quest for “cool looking” school supplies. Carolina Pad has products that stand out against the competition. At the local department store, we normally get the plain ol’ solid red, black or blue binders and notebooks. They have a bunch of collections to choose from including Pattern Play with its cool pastels and Hot Chocolate with its bold, bright colours. You can find binders, notebooks, bags, arts and crafts supplies and more. This summer, Carolina Pad has introduced two hot new collections – the Times Square Collection and the Tiki Lounge Collection- to remind us all of places we’d love to visit. I was sent two binders from the Time Square Collection and two notebooks from the Tiki Lounge Collection to review. 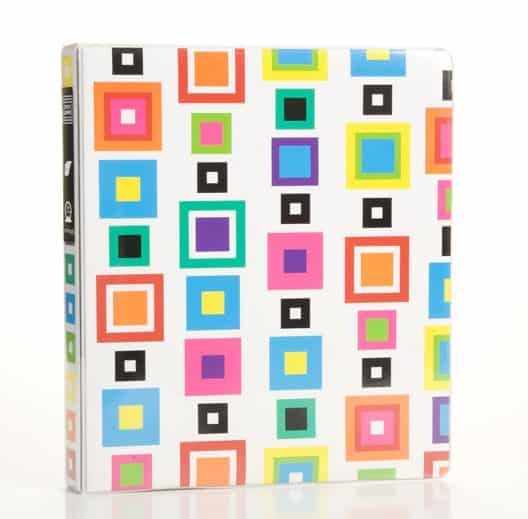 The Times Square collection is a funky design reminiscent of the bright, flashy colours of Times Square in New York City. John and I were just in Times Square in May and it is lit up so brightly even at night! Olivia just loves them and told me that she is excited to use them for school this September. She said they are way better than what I usually buy her. She thinks they are “very cool”- her words! They retail for $5.99 each. Plus, they feel good and sturdy like they will hold up to being lugged back and forth from school to home. Those cheap binders that we have bought in the past never last a full school year, but these ones from Carolina Pad feel strong. They are made from a durable vinyl and have two inside pockets to store papers and notes home. The Times Square Collection comes in three different patterns: Circles, Squares and Stripes. I also received two notebooks (80 pages) from the Tiki Lounge Collection. I kept one for me (I love office products!) and gave the second to Olivia to use for school. I love the bright, tropical design and the thick durable cover with an elastic to keep it closed up tight when you aren’t using it. Olivia wants to use her notebook to record her assignments and homework. I use mine to keep track of my blog stuff. I am “old school” and prefer to write stuff I need to down rather than record it on a computer. 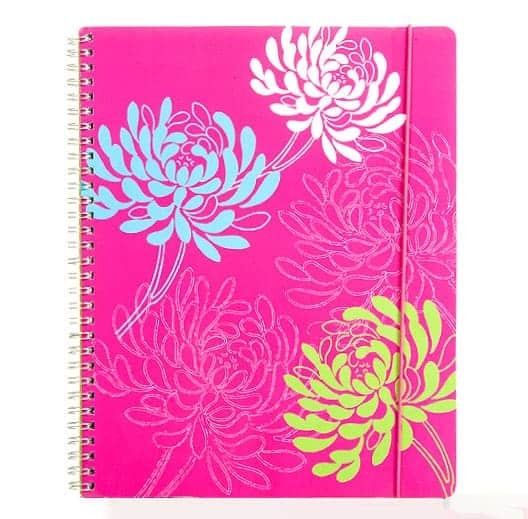 Â These fun, chic notebooks cost $3.99. You can purchase these products online at www.carolinapadstore.com and shipping is free for orders over $40. Get a head start on your back to school shopping now and cross that task off your list! Our summer vacation plans are to drop my son off at college. If I could do anything, I’d spend a week on the ocean at the beach.